Is lá saoire é Lá na Máithreacha (nó “Lá na Máthar” nó “Domhnach an Mháithreachais” (Mothering Sunday i mBéarla)) chun máithreacht agus máithreacha a cheiliúradh, sa dóigh is a cheiliúrann Lá na nAithreacha aithreacht. Tugtar bronntanais do mháithreacha ar fud an domhain ar Lá na Máithreacha. Síochánaí ab ea Ann Jarvis (máthair Anna) agus banaltra a thug aire do shaighdiúirí (in ainneoin cén taobh inar throid siad) sa chogadh cathartha. Bhunaigh sí clubanna ‘Lá na Máthar’ le caint a dhéanamh ar chúrsaí sláinte don phobal ar fad. Bhí a hiníon, Anna, ag iarraidh ómós a thabhairt don obair a rinne a máthair agus leanúint ar aghaidh leis an obair sin. I 1908, rinne Comhdháil SAM magadh faoi iarratas Anna lá náisiúnta Lá na Máthar a bhunú ag rá dá mbeadh lá speisialta do mháthair ann, bheadh lá eile de dhíth don Mháthair Chéile. Samhlaigh gnéasachas agus gáire sotalach maslach anseo. Ach níor lig Anna don aineolas gránna seo an lámh in uachtar a fháil. I 1908 bhí searmanas cuimhneacháin aici dá máthair i séipéal i Virginia Thiar. B’shin tús oifigiúil le lá speisialta a bheith ann do na máithreacha. I 1910 bhí Lá na Máthar oifigiúil i Virginia Thiar, stát Anna fhéin. I 1911 bhí gach Stát ag ceiliúradh an lá ach gan é a bheith oifigiúil i roinnt mhaith acu. I 1914 agus Anna fós ag obair go dian le aitheantas oifigiúil a bhaint amach don lá, d’fhógair an tUachtarán Woodrow Wilson, go mbeadh an dara Domhnach i mBealtaine aitheanta mar lá náisiúnta le onóir a thaispeáint do mháithreacha. Bhí an bua aici. 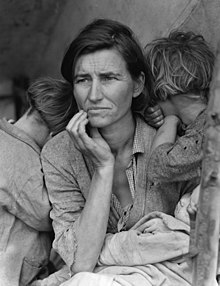 Florence Thompson agus a páistí "Migrant Mother", 1936 sa Mheiriceá. Lá na Máthar a bhí i gceist ag Anna. Ní Lá na Máithreacha. Agus sin a d’fhógair Wilson. Bhí Anna ag iarraidh go mbeadh an lá pearsanta. Ba chóir do gach clann rud éigin pearsanta a dhéanamh dá máthair féin. Cártaí a tharraingt, ní a cheannach. Nó litreacha a scríobh. Mar sin scríobh siad Mother’s Day agus ní Mothers’ Day sa Bhéarla ar an lá. Bíonn daoine ar fud an domhain ag ceiliúradh Mother’s Day na laethanta seo ach ní ar an dáta céanna i ngach tír. Bhí tíortha áirithe ann ina raibh nós cosúil leis seo acu cheana féin. Shocraigh tíortha eile ina raibh cumhacht láidir ag Eaglais iontu ar dháta a roghnú le ciall faoi leith aige ar a bhféilire féin. Ina measc, Éire. An ceathrú Domhnach sa charghas a roghnaigh an Eaglais. Titeann lá na máithreacha ar an ceathrú Domhnach le linn an Charghais i gcónaí in Éirinn agus sa Bhreatain. I dtíortha eile, bíonn Lá na Máithreacha go hannamh ag amanna eile den bhliain. Ach bhí an bua ag Anna Jarvis lena rogha don dara Domhnach i mBealtaine mar sin an lá in úsáid ag formhór na tíre ar an domhan (86 acu sa bhliain 2014). ↑ Lá na Máithreacha vs. Lá na Máthar (“Day of the Mothers” or “of the Mother”)? Tugadh an leathanach seo cothrom le dáta an 23 Meitheamh 2017 ag 11:55.